Everything you want to know is written in the stars! 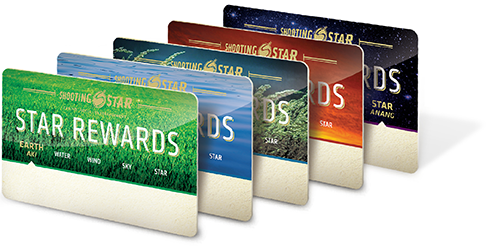 The Star Rewards program lets you shoot for the stars with the most exciting and robust players club program around! Want to know more about Star Rewards? Here are answers to some of our most frequently asked questions. If you need more information, e-mail us and we’ll promptly reply with an answer. How much does it cost to join Star Rewards? Membership in Star Rewards is absolutely free, and there is no annual fee to renew. Membership status is determined by the number of Star Rewards points a member earns by playing at Shooting Star Casino. Changes in play may cause a player’s membership level to change from year to year. Who can sign up for Star Rewards? Anyone 18 years of age and older can sign up for membership. You can accrue points through play at Shooting Star Casino. The more you play, the more points you can earn. What games can I play to earn points? Can I share or give my Star Points away? No. Star Rewards points may not be given, traded, sold or transferred in any other way to another Star Rewards member. Can I give my rewards to others? Premiums and free gifts cannot be transferred to other Star Rewards members or Shooting Star guests unless the prize clearly states that it is meant to be shared. For example, “free meals for Star Rewards members and their guests” means the meal may be shared, but the Star Rewards player must be among those redeeming the reward. How long will my points remain valid? Star Rewards points expire 12 months after the last valid Star Rewards point is earned. How long do my complimentary offers last? Complimentary rewards, such as a free buffet meal for two, will be valid for 24 hours from issuance. Can I redeem my points for cash at any time? When you play “cash-back” games, you may redeem those Star Rewards points for cash. However, points must be redeemed in $10 increments. How and why does my member status change? Membership status is determined by Star Rewards points earned in a given year. As this total changes, yearly status may be adjusted up or down as needed to match your play. What if my Star Rewards card didn’t record my points? It is the member’s responsibility to use the card properly and record the correct number of points. Any play without proper use of the card will not accrue points. What do I do if I lose my Star Rewards card? Star Reward cards can be replaced at the Star Rewards Center, free of charge, with no loss of points. All benefits are based on play. At Shooting Star Casino, Hotel and Event Center, we’re dedicated to giving you more of what you want. That’s why we invite all eligible members to join Star Rewards. Stop by the Star Rewards Center to learn all the basic rules so you can be a Star Rewards member. Member’s use of Star Rewards card indicates acceptance of Star Rewards rules. Star Rewards membership is free and voluntary. All Star Rewards members must be at least 18 years old. Valid photo ID is required for membership in Star Rewards and must be presented to complete transactions. Star Rewards cards, points and benefits are non-transferable and may not be brokered, bartered or sold and may not be transferred upon deal or as part of a civil or domestic relations matter. Star Rewards cards are used to track play and accumulate Star Rewards points only by the person listed on the account. Rewards Points are earned for all tracked slots, blackjack, poker and bingo play. Shooting Star is not responsible for points lost due to an improperly inserted card, machine malfunction or failure to present membership card at specified gaming areas. Management reserves the right to adjust any points balance resulting from malfunction, operational errors and/or fraud. Star Rewards points will remain valid as long as one Rewards point is earned every 12 months. Otherwise, without any use, the entire Star Rewards account balance will expire after 12 months. When redeeming Star Rewards points for cash, redemptions begin at a minimum of $10. All Star Rewards point earnings are subject to review and verification. All decisions regarding the interpretation of rules, eligibility, etc., for this program lie solely with Shooting Star, whose decisions are final. Star Rewards members distributing their cards to others than those registered to the account and/or members purposely leaving their cards in a card reader to accumulate points are subject to membership revocation. Spouses cannot share an account. Membership in Star Rewards may be revoked or cancelled at the discretion of Shooting Star Management without notice. Members must surrender their Star Rewards cards upon request. Shooting Star Management reserves the right to cancel or modify this program at any time without prior notice. When advancing tiers, offers and benefits may not be available for up to 60 days.